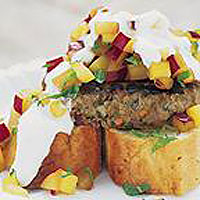 Delicious for a special occasion barbecue, these spicy lamb burgers also make a perfect, quick, mid-week supper dish. Divide the mixture into 4 and shape into burgers. Flatten to about 1.5cm. Cover and chill until ready to cook. To make the salsa, combine all the ingredients in a small bowl. Season and set aside. Cook the burgers on the barbecue, or under a medium-hot grill for 6-8 minutes on each side or until thoroughly cooked, there is no pink meat and the juices run clear. Serve the burgers on warmed Waitrose Garlic Bread with the salsa spooned over the top and with a little natural yogurt on the side. Combine the ground lamb with some finely chopped onion, garlic and mixed herbs. Season and shape into balls and shallow fry until browned and thoroughly cooked, the juices run clear and there is no pink meat. Serve with hot, buttered noodles or spaghetti. Substitute the red curry paste with a green curry paste for a change of flavour. This recipe was first published in July 2000.